The Workflow Design Settings Pane is accessed by clicking the Settings button (cog icon) from within the Workflow Design Pane. Contains the descriptive text that is shown to end-users from the Run Now Pane or Workflow Landing Pane. Indicates the hierarchical group the Workflow is located under within the Workflows Pane. Use \ to create multiple group levels (e.g. Collates sets of related Workflows. 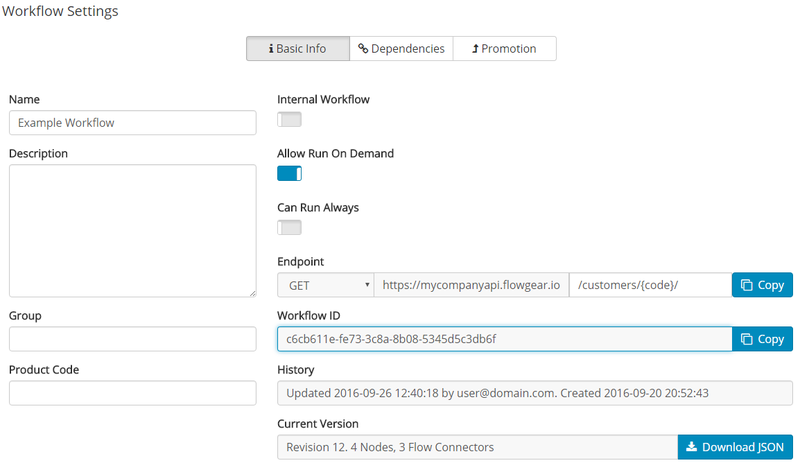 Workflows are provisioned from one Site to another by Product Code. Provides a summary of creation date, last save date and the username of the user who last saved the Workflow. Indicates the current revision number of the workflow (See Revision Management) and also allows the Workflow to be downloaded as a JSON document.